How can I work with storytelling as an intercultural trainer, coach, and facilitator? 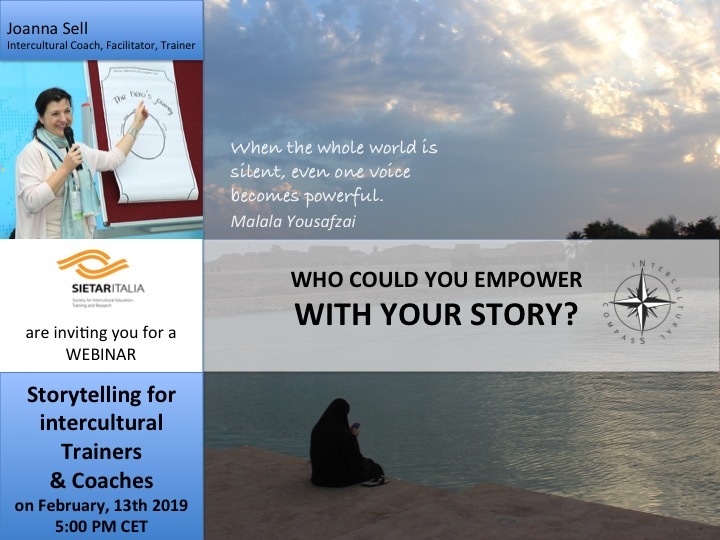 In this webinar, I am going to offer multiple answers to the above questions and propose the storytelling approach for your intercultural programs. After a short input on how storytelling works and how it affects our brains (presentation of the newest neuroscience research), she is going to offer three powerful narrative tools that not only can be used in the intercultural programs but can be given to the participants to work with their own stories and their team stories. The co-creation of stories and story sharing play here an important role. Following the motto, “When in Rome, do as the Romans do,” people wanted to hear do’s and don’ts for communicating and cooperating with the “inhabitants of Rome.” What struck me, mostly, was the fact that they were deeply convinced that such “ready-made recipes” existed. Everything changed once we exchanged stories. Suddenly, the beauty of diversity became tangible and the focus moved towards practicing perspective change, self-reflection regarding communication skills, and a clear shift from “autopilot modus” towards curiosity and acceptance of different thinking patterns. A setting of psychological safety and an atmosphere of trust were the most wonderful gifts most of us experienced during time spent together sharing stories.